StateScoop recently published an article featuring STEER. Continue reading to find out what our CEO, Anuja Sonalker, told StateScoop about what inspired her as well as the convenience that STEER will bring to consumers. The shortest part of the journey is often the most complex for self-driving cars. The first and last mile, usually wrought with traffic lights, signage, pedestrians and cyclists, present endless challenges to autonomous vehicles that even human drivers often couldn’t easily navigate. One company — STEER Tech, headquartered outside of Baltimore — thinks it may have a solution that doesn’t require any new technology from manufacturers. STEER says it owns proprietary autonomous parking technology enabling a service that parks your car after you’ve stepped out of it and onto the sidewalk. The technology, the company says, will be ready as soon as next year and can be applied to almost any car made in 2012 or later. “We are focused on last- or first-mile, depending on how you look at it, but we’re focused on eliminating a consumer pinpoint on their daily living,” STEER CEO Anuja Sonalker said. The company, run by former executives behind automotive cybersecurity companies Battelle and TowerSec, is banking on an internet-connected system to retrofit non-autonomous vehicles into part-time level-4 autonomous vehicles. 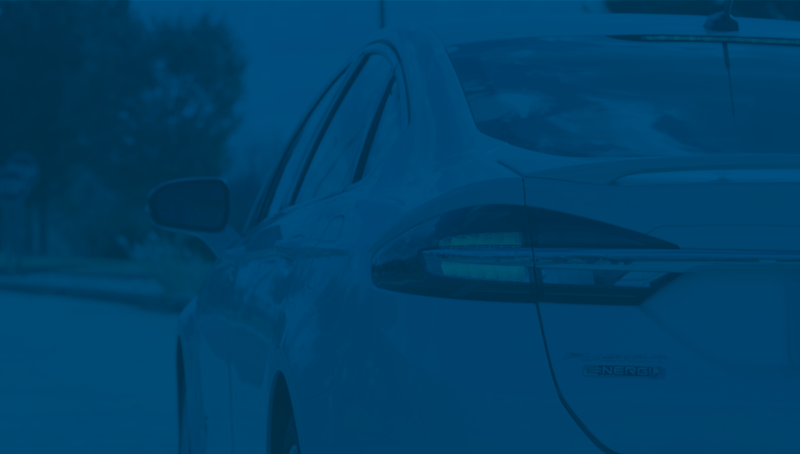 The fourth level of autonomy — rated on an industry-accepted 0-5 scale — is reached when a vehicle can operate without any human input or control, but only in certain geographic or road conditions. For STEER, that geography is a parking lot. 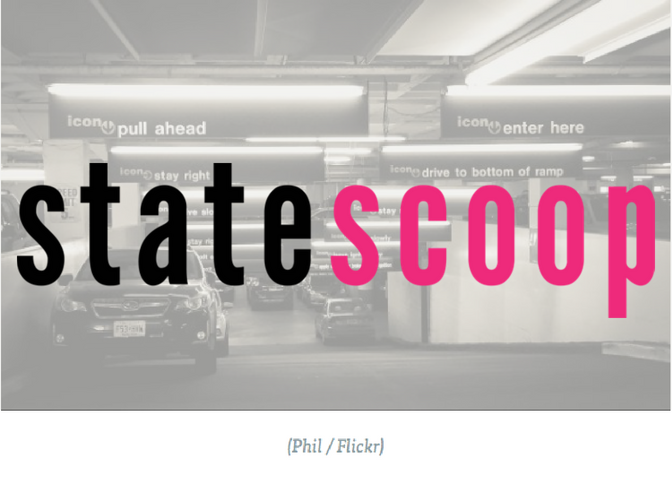 The technology, Sonalker told StateScoop, is an opportunity to simplify parking in typically congested urban areas where spaces come at a premium in both time and money. Sonalker explained her company’s technology as a four-tiered system that relies on communication between an app, designated parking spots, the company’s server and the car. For the technology to work correctly, the company relies on contracts between the owners of existing parking lots or garages and STEER itself to designate drop-off points and STEER-specific parking spaces within the lots. The company already has secured its first of such contracts — the 391-acre Merriweather District Project in downtown Columbia, Maryland, which broke ground in late April with the idea of creating a revitalized core of the city’s downtown, will offer STEER-enabled drop-off and parking spots throughout its mixed-use lots as it is built out over the next 20 years. Residents near the Merriweather District interested in using STEER will apply online for the company’s hardware kit, which is installed by a certified STEER manufacturer inside the trim of the vehicle. The company has not yet released any information about how much a typical installation will cost consumers. Sonalker told StateScoop the technology will be made available with “as little upfront cost as practical,” but did not cite any numbers. “If it’s a Ford Fusion, it’s going to be tucked behind your infotainment center, where your CD player is. If it’s a Lincoln Navigator, it’s going to be tucked behind your steering wheel. It’s going to be inside your cabin, but behind your trim,” Sonalker said. The kit includes software that connects to the electronic “guts” and stock radar and ultrasonic sensors of the car — the reason for the 2012-era manufacturing cutoff, Sonalker said. The kit is installed in tandem with a mobile app that drivers download onto their devices, which is securely paired, the company says, with the car through a STEER cloud server. The app can “talk” to the car through an LTE connection, Sonalker said. When drivers pull up to a designated STEER drop-off point, they put their car in park, step out, and press a button on the app to follow a designated route to an available parking space. The same process is followed when the customer wants to leave — the app is used to recall the car to the specific drop-off spot. Outside of the kit, STEER installs cameras that work with the software to detect pedestrians and other cars in real time, but Sonalker said they won’t change the appearance of the car. Other manufacturers are trying to build the same technology into their fully autonomous vehicles, she said, but STEER isn’t focused on expanding past the parking lot. Because the product relies on STEER-designated landing spots, it doesn’t present a universal solution to the first- and last-mile issues that automakers are keen on solving without external products. Sonalker is aware that the successfully implementing the tech is a monumental task. Autonomous vehicle testing in urban spaces has rarely occurred without at least one human in the vehicle to override the car in case of emergency. 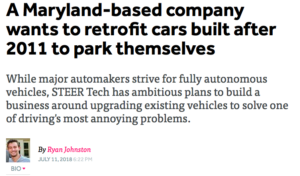 In STEER’s case, it’s successfully secured Maryland’s first AV testing permit in late 2017 to test its technology, and is planning on automated valet parking at the Baltimore-Washington Airport in the near future. Across the country, autonomous vehicle legislation is developing at the state and city level. A report from the National Governors Association published last week laid out guidelines for state leaders to seeking to adopt self-driving technology, and Boston, Denver and Washington, D.C. have all taken steps to allow autonomous testing on city roads.